Did you enjoy the new Swim Suit Costume and the other new content that we added on 7/25? Here are the details of what’s coming in the much awaited August Update! The August Update will include the Academy Clan, which helps new players learn and experience all the Clan related content, and the Equipment Codex, which provides rewards for collecting equipment. We also have other additional improvements to show you as well. Let’s check out the details together! First and foremost! The Academy Clan feature will be added. The Academy Clan is run by the Silverlight Mercenaries where players between the levels of 10 and 180, that haven’t joined a clan, can go to experience and learn about Clan activities. Players between the levels of 10 and 180, that haven’t join a clan, can join the Academy Clan and progress through its features. Note that players on the same server will be assigned to the same Academy Clan to enjoy the content together. For those of you who have been curious about the benefits and features that come with joining a Clan, you can now experience them through the Academy Clan! 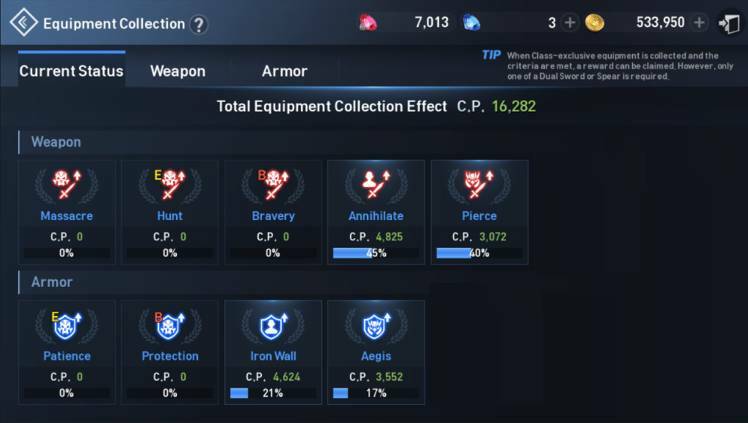 Next, let’s talk about the Equipment Collection which will add to the joy of collecting Equipment and increasing stats. Depending on the achievement progress, you can receive additional stats such as Penetration, Accuracy, Evasion, Crit. Resistance, etc., which will strengthen your character. If you manage to reach tier 5 for each attribute, then you will receive a Master title for each. Ex) Reach tier 5 on all of the following for Annihilate attribute Equipment: Equipment Level, Enhancement Level, Attribute Level, and Limit Break to obtain the title Annihilation Master. Collect all of the Equipment for your character to become stronger! Finally, let’s go over the 3 new features coming with the August Update! – Only the Clan Leader can select and configure the Clan Preferences, which can include language, Clan’s play style, main login time, etc. This should be helpful for recruiting Clan Members or for looking for a suitable Clan. – Now you can find a Clan that fits your style! – From many of our players’ reports regarding in-game chats, we decided to improve on the chat feature. August’s Update will include a new chat reporting feature. You can select the character icon in the Chat window to open a menu with a [Chat Report] button. Tapping this button will allow you to report any profanity, discriminatory chat content, harassment, or any other chat content that may make other players uncomfortable. We will continue to improve the system to provide a clean and enjoyable chat experience. – This new toggle function will allow any player that has difficulty viewing cut-scenes or videos to automatically skip them. We hope that this will provide a smoother gameplay experience to even those with lower spec devices! – However, if you opt to skip but other Party Members opt to view the cut-scenes and/or videos, then you will have to wait until they finish viewing! That’s it for the August update preview! We looked at some of the additions coming with the Update, and we hope you are excited for our next Update as well. Aside from the new content, various events are awaiting! The exact schedule for the Update will be provided in a separate notice, so please keep a look out on our official forum and Facebook page! Until we meet again, happy hunting! Hey Buddy!, I found this information for you: "[EU/NA] Developer’s Note: August Update Preview – Academy Clan and New Content". Here is the website link: http://l2revolutionworld.com/eu-na-developers-note-august-update-preview-academy-clan-and-new-content/. Thank you.